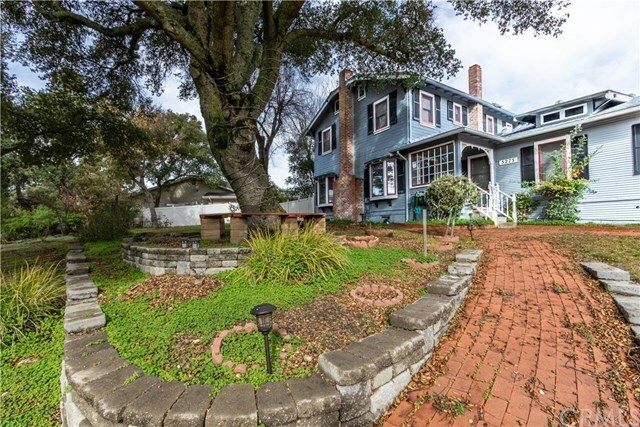 You will feel like you have stepped back in time when you enter this beautiful Atascadero home built in 1929. This 2568 sq ft home sits on a little over a half an acre with majestic oaks and views of the surrounding areas. This 3 bedroom/ 2.5 bath home boasts hardwood and laminate flooring, formal living room with gas fireplace, beautiful doors with crystal knobs, bay windows, separate family room with gas stove, office area, laundry room, formal dining room with built-in china cabinet, and a charming country kitchen with eating area and built-ins. The main floor master bedroom has gas fireplace, dressing room and updated master bath. You will find two bedrooms upstairs with updated guest bath, built-in linen, large walk-in closets and cozy balcony off one of the bedrooms. The outdoor entertaining area is fully fenced with covered patio, firepit, grass area and private deck off the master bedroom. Driving up to the home you will find a large circular drive with plenty more parking in the back. This home has an oversized single car garage with added workshop, as well as large covered RV parking with attached carport and another workshop area for plenty of storage. New septic system installed in December of 2016 and HVAC system installed in March of 2017. Don't miss out....call for your showing today!! !